BIOEDUSCIENCE is a peer reviewed open-access journal that publishes research in the field of Biology and Biosain Education such as: Applied and implemented in education and learning, Botany, Zoology, Microbiology, Ecology, Biotechnology, Molecular Biology, Genetics, Bioinformatics, Cell and Developmental Biology, Biodiversity and Bioconservation. 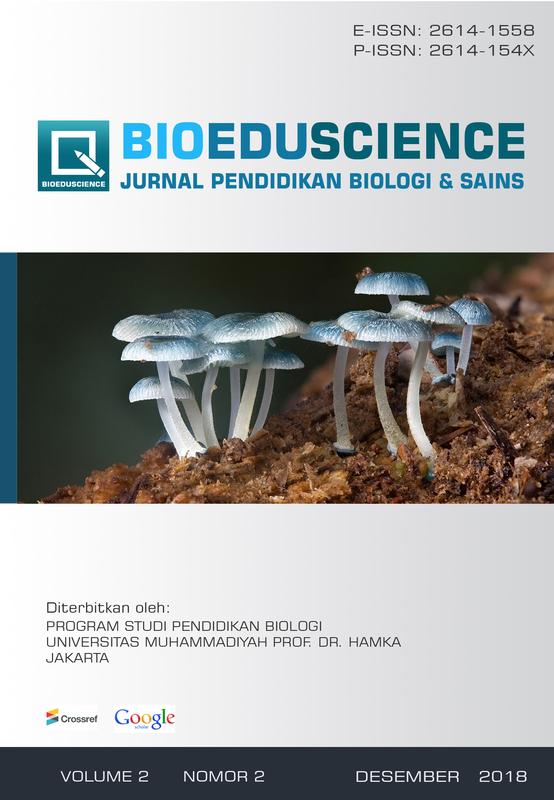 BIOEDUSCIENCE is published by Biology Education Study Program, Universitas Muhammadiyah Prof. Dr. Hamka, Indonesia regularly in June and December. ISSN : 2614-1558 (online); ISSN : 2614-154X (Print). BIOEDUSCIENCE is open access which publishes all fields of Biology Education and Biological Science (Bioscience), such as biodiversity, botany, zoology, microbiology, ecology, biotechnology, and related fields. By publishing biannually, on June and December, BIOEDUSCIENCE is intended to communicate original researchers and current issues on the subject of Biology Education and Biology fields.